It’s all systems go at the Wollongong Science Centre and Planetarium with a refurbishment completed and a host of new public programs on offer. The lead organisation for the Illawarra Science Hub, the Centre will this year extend its audience reach by presenting events for both the seniors community and those in the 18-35 age group. First, the Centre celebrates Senior’s Week with a special performance of the play Of Light and Flight. 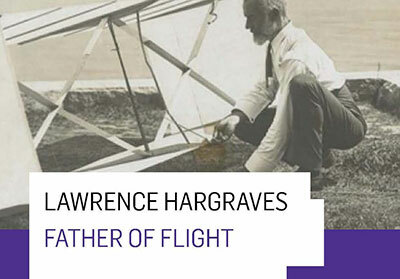 On 6 April, in conjunction with the Eaton Gorge Theatre Company, older audience members and their families are invited to an evening of theatrical performance in celebration of the life and work of Lawrence Hargrave, the father of flight. Beginning with a theatrical welcome, audience members will have the opportunity to meet Lawrence himself with canap-s and drinks. There will also be an opportunity to view the exhibits of the revamped Science Centre; and enjoy a paper plane making activity. Later in the year and building on last year’s hugely popular Science and Cider events, the Illawarra Science Hub presents a brand new series of interactive science experiences at the Centre for the discerning young adult. With three sessions planned exploring chocolate, wine and forensic science, community members will now have a chance to meet scientists and experts in informal and entertaining forums. Targeting young adult audiences that are not usually associated with the Science Centre, the program is designed with basic science in mind, and has a strong focus on hands-on demonstrations. In May, the Science of Wine will feature a talk from local winemaker Simon Hall from Two Figs Winery. A graduate of Charles Sturt University, Simon will kick off the evening with an informative presentation about the process of wine making and the science, chemistry and biology behind it. There will also be wine tasting at various stations in and around science exhibitions. In August as part of National Science Week, the Science of Death will give an insight into the gruesome world of CSI and forensics, focusing on the human body. This will be a joint presentation by three recognised experts, led by James Wallman, a forensic entomologist UOW. Formal proceedings will be followed by interactive activities, including the dissection of various animal organs and a chance to get hands on with forensics. Finally in October, the Science Hub will explore the Science of Chocolate, working with a local chocolate maker. Presenting different types of chocolate, a local expert will discuss the challenges of making it, followed by opportunities for audience members to make some chocolate themselves. Science is all about testing hypotheses, so it wouldn’t be complete without chocolate tasting throughout the night!